Walking to Marrickville Metro just after 8pm last night, Monday 3 March 2008, and all the street lights went out. Houses too. Well most of them as, interestingly, the odd house’s lights stayed on. Must have been on a different grid? For around 45 minutes between 8 and 9 pm there was a blackout in parts of Enmore and Marrickville. I later found out from the local 7 Eleven that it affected their store in Petersham too. So, not a small thing, but looking at online new papers and none of them seem to have picked it up as a story. Must not be very interesting. And the Energy Australia site is quite useless if you want to find out about blackouts or other faults. Or, maybe it was just my imagination? It never actually happened? I think Woolworths Marrickville Metro would have something to say about that. 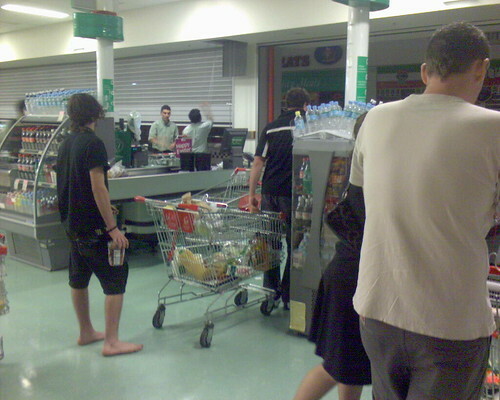 With main power out Woolworths was surviving on generators designed to power it for 20 minutes. Only important things had power, the registers and half the lights. As you can see from the picture below, they were manually closing all the doors as they tried to speed all the customers through the checkouts and close the store. It is disappointing that, while the blackout in the inner west last July got a reasonable amount of coverage, this one has received none at all (that I can find). This entry was posted in News, Photos and tagged photo, power, Woolworths. Bookmark the permalink.